Your Bizzy Boutique online store builder system comes with several pages already built-in, ready for you to activate and use. Search: The "Search" page is simply a page where your website visitors can search through your online store. See live example here. Site Search: Another search feature page with additional search capabilities. Site Map: A full site map of your site is populated when you activate this page. See live example here. 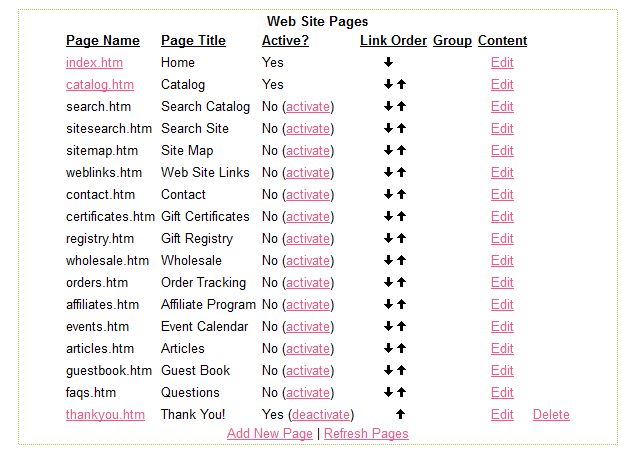 Web Links: Activating your "Web Links" page will allow you to input links into your store admin/weblinks area. Contact: This is your built in contact form. Be sure to enter an address in store admin/site settings/admin email so the contact form will know where messages should be sent. Certificates: Gift certificate purchase and details page. Registry: This is your gift registry page. Wholesale: Wholesale information and sign up form page. Orders: Allow your customers to track their order status from your website by activating this page! Affiliates: Affiliate sign up form and details page. Articles: Informaiton and details for your articles page. Guestbook: Activate your online guestbook and allow visitors to input reviews and testimonials for your business.